Abstract: Colchicine overdose is uncommon but potentially life threatening. Due to its serious adverse systemic effects, overdose must be recognized and treated. We report a case of an 18-year-old female who ingested 18 mg (~0.4 mg/kg) of colchicine in a suicide attempt. The patient’s clinical manifestations included abdominal cramps, vomiting, pancytopenia, hypocholesterolemia, and rhabdomyolysis. Two unique manifestations of toxicity in this patient were profound and persistent, severe hypertriglyceridemia and electrolyte imbalance, mainly hypophosphatemia, with no other evident cause except the colchicine intoxication. Following intensive supportive treatment, including ventilator support, N-acetylcysteine, granulocyte colony stimulating factor, electrolyte repletion, and zinc supplementation, the patient made a complete recovery. Colchicine intoxication is a severe, life-threatening situation that should be followed closely in intensive care units. Severe changes in body functions can rapidly develop, as previously described in the literature. To our knowledge, this extremely elevated triglyceride level has never been reported without the administration of propofol, and requires further evaluation. A previously healthy 18-year-old female was admitted to our intensive care unit (ICU) after being transferred from a different hospital due to ingestion of approximately 30 tablets of colchicine (18 mg) 3 days prior. Colchicine is a neutral and lipophilic alkaloid from the plant Colchicum autumnale and is a microtubule polymerization inhibitor. It is primarily used to treat acute gout as well as familial Mediterranean fever. It has been used in the treatment of gouty arthritis for centuries. Adverse effects of colchicine use are characterized by “crampy” abdominal pain, diarrhea, nausea, vomiting, headaches, and fatigue. Colchicine toxicity has been characterized by cytopenias (especially thrombocytopenia), electrolyte imbalance (especially hypophosphatemia and hypozincemia), and elevated creatinine phosphokinase (CPK). At the time of admission (3rd day post-ingestion), she was alert and oriented but had suffered from vomiting and diarrhea for more than 2 days. She experienced mid-epigastric pain with intermittent bilious vomiting. The patient also presented with hepatic disturbances and metabolic acidosis. The results of a complete evaluation for infectious disease were negative. Her vital signs were unremarkable except for a pulse of 143 beats/minute and shortness of breath. There was mild abdominal distension but bowel sounds were normal. Written informed consent for the case details to be published was provided by the patient. Electrocardiogram was unremarkable. She presented with elevated partial thromboplastin time, international normalized ratio of 52 sec and 2.4 respectively. Her platelet count was 100,000/mL and her fibrinogen was 205 mg/dL. Plasma electrolytes on admission (3rd day post-ingestion) were significant for mildly decreased phosphorous of 2.1 mg/dL, potassium 3.18 mEq/L, magnesium 1.39 mg/dL, and corrected calcium of 7.16 mg/dL. Despite receiving extensive electrolyte supplementation since the day of admission, persistent, severe electrolyte imbalances persisted and were difficult to control. Her electrolyte measurements included magnesium ranging from 1.39 mg/dL to 1.76 mg/dL and potassium ranging from 2.7 mg/dL to 3.49 mg/dL. The most profound electrolyte disturbance was hypophosphatemia reaching as low as 0.7 mg/dL on day 8. Rhabdomyolysis was diagnosed by elevated CPK levels up to 8,500 units/L and the urine tested positive for myoglobin (Figure 1). Figure 1 Time-course of patient’s laboratory findings and symptoms. Notes: Elevated CPK (>180 units/L); neutropenia (neutrophil count <1,000 mL); thrombocytopenia (platelets <100,000/mL); fever (temp >38.1°C); hypophosphatemia (phosphorus <2.5 mg/dL); coagulopathy (INR >1.7); respiratory distress (RR >20/min, PaO2/ FiO2 <200). Abbreviations: CPK, creatinine phosphokinase; INR, international normalized ratio; RR, respiratory rate. On admission (3rd day post-ingestion) she also had an elevated triglyceride level of 816 mg/dL which later reached a peak of 1,273 mg/dL on day 10. This was accompanied by HDL levels ranging from 7 mg/dL to 13.7 mg/dL on day 4 and day 10, respectively. On arrival, she was given n-acetylcysteine (NAC) based on a previous case report describing successful NAC treatment in colchicine intoxication.1 Her paracetamol level was undetectable. No change in her condition was noted post-treatment. The patient developed pancytopenia on her 4th day post-ingestion which resolved on day 9 under granulocyte colony stimulating factor treatment.2–5 Absolute neutrophil count was 8,100/mL and reached nadir 300/mL on day 6. Hemoglobin nadir 7.8 g/dL was on day 8. Platelets nadir was on day 7 with a level of 20,000/mL. Mean platelet volume of the patient was 6.8 fL on admission indicating bone marrow failure. On day 5 the patient exhibited mucosal damage and bleeding mainly in the mouth and eyes. On day 5 she received the granulocyte colony stimulating factor (filgrastim) treatment. Since high-grade fever had developed on day 4, she was treated with piperacillin/tazobactam. Platelet transfusions were given on day 7 when the absolute number decreased below 20,000/mL. On day 8 there was an improvement in her counts. On day 6 post-ingestion she developed respiratory distress and hypoxemia accompanied by bilateral pulmonary infiltrates, compatible with the diagnosis of acute lung injury (ALI), which was treated with non-invasive mechanical ventilation and negative fluid balance. The ALI resolved on day 9. The patient was also treated with intravenous multivitamins and trace elements with oral zinc supplementation to avoid hypozincemia. Fourteen days post-ingestion the patient was transferred back to the referring hospital in a good condition. Figure 2 shows the changes, over time, of CPK and phosphorus and their return to acceptable levels. 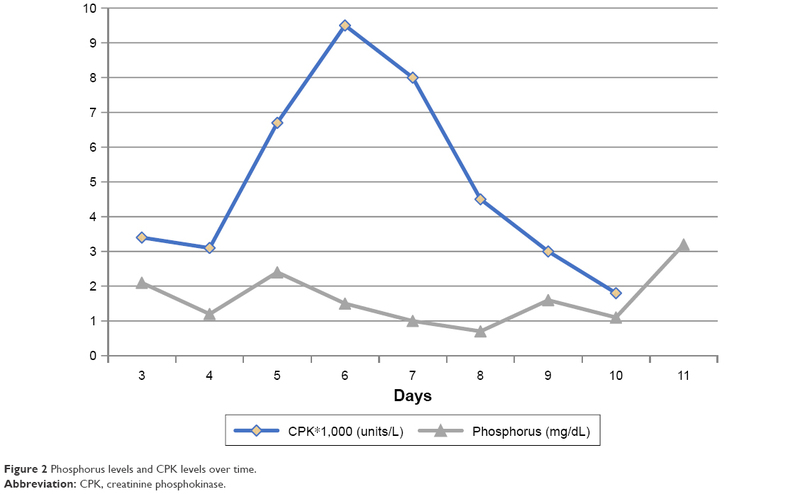 Figure 2 Phosphorus levels and CPK levels over time. Elevated triglyceride levels have been previously reported by others,6 but were attributed to propofol infusion syndrome. However, in our patient, propofol was not administered. We hypothesize that the high level of triglycerides was partly due to intense inflammatory response and a decrease in lipase activity. The low HDL levels and high CRP levels support the inflammatory concept. However, the triglycerides level continued to rise despite resolution of other symptoms and increase in HDL level, implying that inflammation by itself is not enough to explain such severe hypertriglyceridemia. Moreover, after oral ingestion, the mean half-life of colchicine is 9 to 16 hours. It is rapidly absorbed from the gastrointestinal tract after ingestion and undergoes significant first-pass hepatic metabolism. Since the triglyceride levels continued to elevate 10 days after oral ingestion, it is highly unlikely that the effect was pharmacological. To our knowledge no direct or indirect effects of colchicine in terms of apolipoprotein metabolism have been described. The patient required massive doses of phosphate supplementations due to an unknown mechanism, but it was probably related to cellular redistribution, like that seen in re-feeding syndrome. The intensity of the phosphate drop was overwhelming and exceeded our protocol of 18 mmol to 21 mmol of potassium phosphate. The rhabdomyolysis that was present preceded the nadir in phosphate level and was most likely not the cause of it. The patient was also treated with zinc supplementation due to hypozincemia which is very common in critically ill patients.7 In addition, the rationale of avoiding hypozincemia was based on an animal study indicating severe mucosal injury when colchicine is given in animals with zinc deficiency.8 This could be related to the crucial role of zinc in the function of the microtubule. Colchicine intoxication is a severe, life-threatening situation that should be followed closely in ICUs. Severe changes in body functions can develop rapidly. This patient displayed some unique characteristics with severe bone marrow suppression and profound hypophosphatemia requiring intensive electrolyte repletion. To our knowledge, the extremely high triglyceride level has never been reported without the administration of propofol, and requires further evaluation. Ioulia I, Lan J, Chin C, Werb R, Levin A. Massive colchicine overdose with recovery. Case Rep Nephrol Urol. 2012;2(1):20–24. Harris R, Marx G, Gillet M, Kark A, Arunanthy S. Colchicine-induced bone marrow suppression: treatment with granulocyte colony-stimulating factor. J Emerg Med. 2000;18(4):435–440. Harris R, Gillet M. Colchicine poisoning-overview and new directions. Emerg Med. 1988;10:161–167. Critchley JA, Critchley LA, Yeung EA, Young RP, Young RJ, Chan TY, Goh VK. Granulocyte colony-stimulating factor in the treatment of colchicine poisoning. Hum Exp Toxicol. 1997;16(4):229–232. Grossmann A, Lenox J, Deisher TA, Ren HP, Humes JM, Kaushansky K, Sprugel KH. Synergistic effects of thrombopoietin and granulocyte-stimulating factor on neutrophil recovery in myelosuppressed mice. Blood. 1996;88(9):3363–3370. Montiel V, Huberlant V, Vincent MF, Bonbled F, Hantson P. Multiple organ failure after an overdose of less than 0.4 mg/kg of colchicine: role of coingestants and drugs during intensive care management. Clin Toxicol (Phila). 2010;48(8):845–848. Besecker BY, Exline MC, Hollyfield J, Phillips G, Disilvestro RA, Wewers MD, Knoell DL. A comparison of zinc metabolism, inflammation, and disease severity in critically ill infected and noninfected adults early after intensive care unit admission. Am J Clin Nutr. 2011;93(6):1356–1364. Dinsdale D, Williams RB. The enhancement by dietary zinc deficiency of the susceptibility of the rat duodenum to colchicine. Br J Nutr. 1977;37(1):135–142. Finkelstein Y, Aks SE, Hutson JR, et al. Colchicine poisoning: the dark side of an ancient drug. Clin Toxicol (Phila). 2010;48(5):407–414.